Thank you for stepping up to take a stand in support of those MAGA issues and their need to be implemented here in CA. We are focused on the “ISSUES: that will make each of our communities “Great Again." 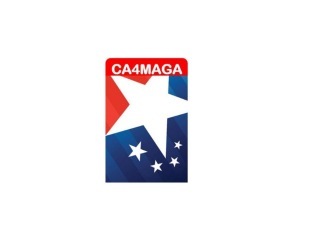 CA4MAGA is registered with the Federal Elections Commission, the Fair Political Practices Board, and the Secretary of State. Provide that "club" or support unit for MAGA Supporters . Work with elected officials providing positive support, education, and advocacy as needed at town halls, during legislation, and other opportunities to be the voice of support for MAGA issues. We are open to ALL registered voters (non-Republicans are “associate” members) to increase broad participation. CA4MAGA requires at least ten (10) registered Republican members to form a chapter, less than that is a non-voting "Associate Chapter." In addition, CA4MAGA's goal is to be in at least ten (10) counties, with at least three (3) of these chapters recognized as a “Local Charter” by the county Republican Party. CA4MAGA wants to maintain a membership base of at least 200 persons statewide. (A) Region 1 (North West) shall include the following counties: Del Norte, Humboldt, Mendocino, Sonoma, Napa, Lake, Solano, Trinity, and Yolo. (B) Region 2 (North) shall include the following counties: Yuba, Butte, Sierra, Plumas, Lassen, Nevada, Shasta, Tehama, Glenn, Colusa, Sutter, Modoc, Siskiyou, Placer, El Dorado, Amador, Alpine, and Calaveras. (C) Region 3 (Bay Area) shall include the following counties: Alameda, Contra Costa, San Francisco, San Mateo, Santa Clara, and Marin. (D) Region 4 (Central Valley) shall include the following counties: Tulare, Kings, Fresno, Madera, Mariposa, Tuolumne, Stanislaus, Merced, Kern, San Joaquin, and Sacramento. (E) Region 5 (Central Coast) shall include the following counties: Ventura, Santa Barbara, San Luis Obispo, Monterey, Santa Cruz, and San Benito. (F) Region 6 (Los Angeles) shall include the following counties: Los Angeles. (G) Region 7 (Inland Empire) shall include the following counties: Riverside, San Bernardino, Inyo, and Mono. (H) Region 8 (South) shall include the following counties: San Diego, Imperial, and Orange. This online New Member Application is CONFIDENTIAL and is not to be made public. Members need to fill this out before they can vote. Associate Members (not registered Republicans, or under the age of 18) also pay $25. Donations and membership dues are NOT tax deductible. Checks can be made out to “CA4MAGA or Californians for Making America Great Again”. If cash is given, please give a receipt. Names and addresses need to be VERIFIED of each membership, and this again is confidential.There is a roster for each new chapter as part of their secured online organization. This roster is updated and added to each meeting Minutes (include name and date a member). Minutes and the Attached Agenda need to be copied for your records and sent to the State Executive Chairman or attached to the online file system. Office Manager: (when applicable: Administrative Assistant/support of the volunteers’ efforts for a successful organization [i.e. arranges to furnish it with office equipment, supplies, and furniture; arranges installation of phone and internet service, etc.]. Maintains a binder of contacts for all aspects of the chapter and state charter organization including numbers to refer to media, legal, security, fundraising, etc. Maintains refreshments and provides support for incentive programs for volunteers). Social Media Manager: (May also be Print Media Manager. Responsible for maintaining and administering content of County Social Media presence in Facebook, Twitter, Instagram, etc. Ensures fidelity including volunteer recruitment, event postings, and relevance of content, and vetting of social media members. Organizes a Social Media committee to post online comments with local and state media, elected officials websites and social media platforms, etc. Eliminates Fake and/or irrelevant news; Works closely with Regional Media Team and takes direction from Chapter President, Regional Field Director, and State Charter Media contact. III. Financials: One of the many reasons why a 501(c)4 is most attractive is that we ARE allowed to carry on partisan (Republican) activities as long as it is not our PRIMARY function. Our focus is on MAGA advocacy, not party or candidate politics. 501(c)(4)sTax StatusTax-exempt; contributions to a 501(c)(4) are not generally tax deductible We may carry on partisan political activities subject to federal and state campaign finance laws but must be secondary, not primary. Thank you for helping CA to take the lead in supporting Make America Great Again Agenda here in this state, and in so doing educating the public on what it means to be a unified, positive, and with a vision to better our world for wall. Brooklyn for trump - dor or die republican !